The campaign for the election of our new President has been going on for a while now. While I am very interested in the election, I have not written about it much - other than writing about waist lines! The campaign has so far been very nasty in my view. Gay Mitchell is already painted as a loser, Dana has been ridiculed over her dual US-Ireland citizenship, David Norris has been pilloried mercilessly about letters, Seán Gallagher is being linked with Fianna Fáil, Mary Davis can't deal with being asked about board memberships, Martin McGuinness is continually asked about the IRA, only Michael D seems to be escaping the at time vicious delving into each of the candidates pasts. FFS - Irish Times journalist Colm Keena (a classmate of mine in Trinity) confessed on radio that he used Google to find a story about Dana (Dana became US citizen before 1997 election bid). I have always voted #1 for David Norris in the Trinity Senate Elections (see my post from 29th March last - "I told David Norris to be Quiet"). If he stands again, I will vote #1 for him again. I see no reason to alter my support for him now. Despite getting a nomination by the skin of his teeth, he has since performed very badly. Gene Kerrigan in today's Sunday Independent called him "a crap candidate". The Trinity electorate is a much easier prospect to handle than the whole of Ireland. He has made mistakes. I would have loved to have seen him in the Áras, but I don't think he will get even close and will be eliminated at the second or third count. Martin McGuinness has balls - he needed them during the building of the Peace Process in Northern Ireland, and to work with the Unionists in the Assembly. He does not hide his IRA past, but there have been many failed efforts to link him to murders and robberies. Sure his past is violent, but since the early 1980s this has changed dramatically. I do see some substance in him as a politician and a populist, and I think he is a serious candidate who will easily make it to the second last count - perhaps even the last. My vote here is also tactical (aren't they all?) 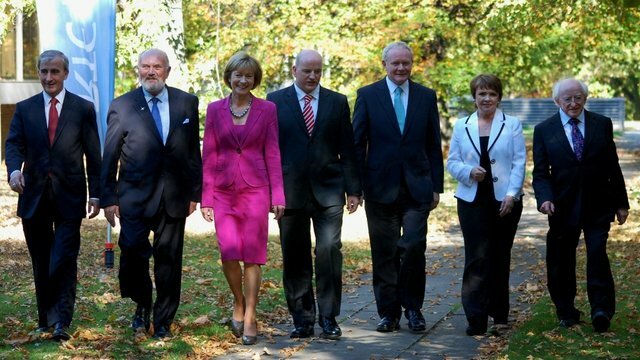 - as after David Norris is eliminated, I don't want my vote to transfer to any of the other candidates. I don't intend to give more than a #1 or #2 vote - but if I did continue down the ballot paper MDH would be #3. I don't really have anything against him other than he is from the Labour party and that he is 70 years old. I have never voted Labour, and don't intend to start. At 70, I've no doubt he is still capable of doing the job - but he will be 77 at the end of the Presidency. I'm being ageist I know, but 77 is too old - he should retire. I sometimes give Fine Gael candidates in elections #3 and lower votes (after I have filled out votes for the Fianna Fáil candidates). So on that basis he would be next. I'm really surprised he is doing so badly in the polls - he has failed to inspire, and the Fine Gael leadership is clearly chickening out of supporting him in fear of being associated with a loser so soon after the General Election. I find him a very dull candidate, and I feel that he would be a dull President. I must confess that Gallagher is the candidate I know least about. I've never watched Dragon's Den (I'd prefer WWF to this!) - so I don't see the attraction of him at all. He is doing well in the polls - perhaps because he is not one of the other candidates. He is being linked with Fianna Fáil (from which he retired earlier this year) - I don't see this costing him votes, he might benefit from votes from FF voters (but not me) who have no candidate of their own to vote for. He will do well, but will not make it to the final count. As a Cavan man I'd expect Martin McGuinness to do well with his transfers. I'm sure Mary Davis is a decent person, but what on earth made her think that the Irish people would elect her to the highest office in the land? Sure she did a great job for the Special Olympics - but it takes more than that to become President. She is also tainted by being a serial Board Member on numerous Quangos - and making it sound like she was doing us all a favour. No - she's a lightweight in a race for heavyweights. "You bet your boots" Dana is a straight talking bullshitter. Likely to come last in the election she will have the least impact on the electorate. I didn't give her a vote in the 1997 election, and won't this time either. Her type of religious right-wing intolerance has no place on modern Ireland. She's out of her depth in this race and I predict she will poll badly - however, she could do well in getting the "none of the above vote".